pose a potential risk to health, property, or the environment. Everyone knows that hazardous materials are found in industrial settings and many commercial operations. But many people do not realize that they have hazardous materials right in their homes. Household hazardous materials (HHM) are any materials that have the potential to create a hazard if handled improperly. Under normal conditions HHM can be a valuable asset in the home. Used or handled improperly, they can be a threat to the health and safety of everyone in the home. Examples of improper handling include not following the label directions, allowing the material to remain in a damaged or leaking container, or storing the container where the contents might freeze or in a hot or damp environment. Storing material in a container other than the original container is considered improper handling, as is allowing a potentially hazardous material to be stored where children, pets, or other incapable individuals might reach it. Incapable individuals would include anyone who could not read and understand the label directions, or anyone who could not act rationally and responsibly in the use of the material. HHM are found throughout most homes. In the kitchen, the corrosive oven cleaners and drain openers can cause severe burns to the skin, blindness, or poisoning. If exposed to sources of heat or ignition, aerosol cans can cause explosions or become dangerous projectiles. Common lamp oil or pet sprays can cause poisoning or death if ingested. Infants and toddlers are frequently poisoned by consuming HHM. Infants do not understand the associated hazard. Additionally, their sense of taste may not be as sensitive to pungent or unpleasant flavors. In the bathroom, hair treatments, bowl cleaners, and aerosol cans must be stored and used with care to prevent poisoning, burns, blindness, or explosions. Additionally, the medicines and thermometers that we use to help our families can become a threat to their wellbeing if mishandled. Mis-administration of medicines can result in poisonings. Needles and sharps should be stored carefully and disposed in a rigid container to avoid accidental punctures and transmission of pathogens. Mercury from a broken thermometer can cause long and short term health effects and should always be quickly and carefully contained for proper disposal. DO NOT mix different cleaners. Several common household cleaners, when combined, will react to form a poisonous gas. Caution is recommended when using any other toilet bowl cleaner at the same time an in-tank cleaner is being used. The in-tank cleaners should be removed and the toilet flushed twice before another cleaner is used. As you look around your home, you will identify many HHM. You may want to replace some of these items with a less hazardous alternative. Because many of these materials are an integral part of your life, you will probably not want or be able to discontinue the use of some of them. If you and your family store and use these materials carefully, there is no reason to eliminate them from your life. Make certain that all HHM is used according to label directions and stored beyond the reach of children, pets, and individuals unable to read and follow label directions. Store HHM in the original containers, away from extreme temperature and dampness. Should the original container become damaged, use or dispose the material properly and promptly. 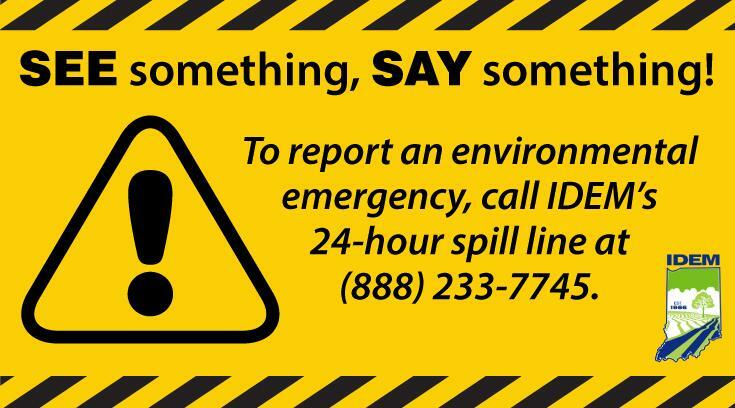 If you witness a hazardous materials release, report immediately by calling 911. Do not enter the area contaminated by the hazardous material or cloud. Avoid any contact with the hazardous material or cloud. If you hear a warning signal or siren, turn on your radio or television for emergency information. Follow all instructions carefully. If asked to evacuate or "shelter-in-place" do so immediately as outlined in this brochure or as instructed by officials. If contaminated by hazardous materials, seek medical help immediately by calling 911. Stay alert for warnings from the Emergency Alert System (EAS), outdoor warning sirens, Cable Interrupt System, NOAA weather radio, local T.V. and radio stations. Learn where hazardous materials are handled, stored, or transported near you. Know how to use and store chemicals properly. Learn the meanings of the labels on the sides of chemical containers and trucks.